There's no possible way you could experience all the treasures of Bangkok in just a few days. At a minimum, you need between four to five days to explore this marvellous city. Not only are there so many things to do in the Thai capital, but the tropical heat and crowds of people can also easily wear you down. Booking at least four days in Bangkok will ensure you get to see all of the city's greatest sites in comfort. Just so you know, some of the best areas for tourists in Bangkok are Watthana's trendy Thong Lor and along the long central Sukhumvit Road. Not only are these areas ideally located for sightseeing, they also have some of the best nightclubs, restaurants, and shopping centers in the city. To help you plan your first trip to Bangkok, take a peek at this day-by-day itinerary. If you follow this five-day guide, you'll see all the major sites without wearing yourself out. On your first day in Bangkok, it's a great idea to take in the city's iconic Royal Palace and celebrated Buddhist temples nearby. Luckily for you, all of these tourist hot spots are in or near the central Rattanakosin area. Just be sure to wear conservative clothing when entering these sacred sites. First head to Thailand's top tourist attraction: the Royal Palace. As you could tell from the name, the opulent Royal Palace was built for Thai kings and queens. Specifically, this ornate complex was built for King Rama I in 1782. Today, this building no longer serves as the Thai Royal Family's residence, but it's still incredibly well-maintained. While you enjoy the wide-variety of architectural styles in this complex, be sure to spend some extra time in the Grand Palace's Buddhist temple: Wat Phra Kaew. Inside this temple you'll find one of the most revered sacred objects in the Buddhist world: the Emerald Buddha statue. Created sometime in the 14th century, this precious statue is a pilgrimage site for faithful Buddhists around the world. The Royal Palace is open from 8:30AM to 3:30PM and tickets cost 500฿ per person. After you've finished exploring the Royal Palace, take a short walk behind Wat Phra Kaew to yet another famous Buddhist temple: Wat Pho. Like Wat Phra Kaew, Wat Pho is celebrated for its Buddha statue. Unlike Wat Phra Kaew, however, Wat Pho's statue is a massive 150-foot long reclining Buddha. Decorated with gold leaves, the Buddha statue in Wat Pho depicts the Enlightened Buddha before his passing into Nirvana. Besides this massive Buddha statue, Wat Pho has one of the largest collections of Buddhist images in the world. Wat Pho is also famous for housing the best massage school in all of Thailand. If you're looking for a quick way to de-stress from your sightseeing adventures, then you must book a Thai massage here! Wat Pho is open from 8:00AM to 5:00PM and costs 100฿ to enter. Don't miss out on Wat Arun, which is a short boat ride across the Chao Phraya River from Wat Pho. It's hard to miss Wat Arun's central prang, which soars a whopping 288-feet into the sky. Before the construction of modern skyscrapers, Wat Arun was the tallest building in Bangkok. Made in the 1800s, this temple is highly respected for its intricately decorated exterior, which is made mostly out of Chinese seashells and porcelain tiles. One great feature of Wat Arun is that you can climb all the way to the top to get a superb view of both the temple and the surrounding environs. In case you were wondering, "Arun" roughly translates to the "Temple of Dawn," so it's sometimes recommended to visit this temple either at daybreak or sundown. You can enter Wat Arun between 8:30AM to 5:30PM for 100฿. While you're in the neighbourhood, consider visiting two of Bangkok's most famous museums: the Museum of Siam and/or the Bangkok National Museum. Both of these museums are within a 15-minute walking distance of the Royal Palace. Tourists who aren't into the traditional museum experience should give the Museum of Siam a try. This interesting museum was designed to make learning about Thailand's cultural identity fun and engaging. Visitors are encouraged to play on numerous interactive exhibits to uncover the wonders of Thailand's past and imagine Thailand's future. The Museum of Siam is open between 10AM and 6PM Tuesdays through Sundays. Thailand's National Museum, on the other hand, is a great place to explore if you're a history buff. This impressive museum, which used to be the palace for the country's Vice King, contains numerous artifacts from Thailand's pre-history up to the present day. As you tour this museums you'll find many royal artifacts, works of Buddhist art, and the UNESCO-recognized King Ram Khamhaeng Inscription. The Bangkok National Museum is open from 9AM to 4PM Wednesdays through Sundays. See a great list of Bangkok Temples together with a map that can be downloaded onto your phone. Bangkok is one of the best cities in all of Asia for shop-a-holics. From ultra modern shopping malls to centuries-old river markets, there's something bound to delight everyone in this electrifying city. It's a good idea to set aside one day to visit a few of the shopping centers listed below. If you'd like to visit one of Bangkok's legendary river markets, then consider waking up early and travelling south of the city's center to the Damnoen Saduak Floating Market. Located in Samut Songkram Province, the Damnoen Saduak Market is actually composed of three floating markets: Ton Khem, Khun Phitak, and Hia Kui. Once you get here, you can rent a paddle boat of your own, take a tour, or just stroll across the canal. Dating back to the 19th century, Damnoen Saduak Floating Market is best known for its fresh produce, flowers, and fish. There are, however, many boats selling souvenirs. Taking a long-tailed boat ride through this market is the best way to experience all the chaotic wonder of this uniquely Thai experience. There's also a popular Tiger Zoo in the area if you want to take a slight detour. Damnoen Saduak Floating Market is open from 7AM to 11AM. It takes about a one-hour drive from downtown Bangkok to get here. Selection of Floating Markets in Bangkok, together with a map to download. The most popular shopping mall in Bangkok is the Siam Paragon in the Pathum Wan district. Considered Bangkok's elite shopping destination, Siam Paragon is large and luxurious. In addition to brand-name fashion shops, this mall boasts its own aquarium, Cineplex, and even has sports cars inside. You can get to the Siam Paragon from the Siam BTS Skytrain station. This mall is open from 10AM to 10PM every day of the week. One of Bangkok's most famous weekend markets is Chatuchak by the Kamphaeng Phet MRT station. This 35 acre market has both indoor and outdoor stalls. Although it's become a bit touristy in recent years, there's still a good mix of locals and visitors shopping at Chatuchak's thousands of stalls. All of Chatuchak's vendors are open for business Saturdays and Sundays from 9AM to 6PM. Certain sections of this market are also open Wednesdays through Fridays from about 7AM to 12PM. Be sure to arrive as early as possible to avoid the massive crowds. When Bangkok's sun sets, the shopping continues! Of the many night markets in this city, one of the best for tourists is the Rot Fai Market in eastern Srinakarin. This large and colourful market is best-known for selling offbeat items and souvenir clothing. Don't worry about getting hungry while walking around here because Rot Fai Market has some of the best street food vendors in the city. This night market is open Thursdays through Sundays from 5PM to 12AM and can be reached by taxi from the BTS station On Nut. View a selection of Bangkok night markets. After all that sight-seeing and shopping, it's time for a little break before the second major leg of your vacation. On your third day, schedule some "me-time" in these relaxing spots. The best place to escape the stress of Bangkok's concrete jungle is in the city's 142-acre Lumpini Park. Built in the 1920s, this public park hosts some of Bangkok's best group exercise activities ranging from relaxing Tai Chi to heart-pumping aerobics. Lumpini has a beautiful man-made pond and a few winding nature trails. Many special gatherings are held in Lumpini throughout the year including live music festivals, meetings with Buddhist monks, and bird-watching tours, so always be on the lookout for exciting events. Definitely schedule a few hours in Lumpini to enjoy the more tranquil side of this hectic city. You can easily access Lumpini Park from the Silom MRT station. Lumpini is open from 4:30AM to 9:00PM. Another lovely Bangkok attraction is the historic Jim Thompson House. This house once served as the residence of famous American entrepreneur Jim Thompson, who famously revitalised the Thai silk industry. Built with teak wood using both Eastern and Western designs, the Jim Thompson House is composed of six houses, all of which have artefacts from Thompson's personal collection. Just a few of these rare objects include Chinese porcelain, Buddhist statuary, and, of course, luxurious Thai silks. Surrounded by immaculate gardens and the Saen Saeb Canal, the Jim Thompson House has a charming aesthetic allure all its own. You can visit the Jim Thompson House between 9AM and 6PM any day of the week. Tours cost 200฿ for people older than 22, 100฿ for people between 10 and 22, and are free for children under 10. The Jim Thompson House is a short walk from the National Stadium BTS stop. It's a great idea to close out this relaxing day by watching the sunset in Benjakiti Park near the BTS Asok station. This 52-acre park is relatively recent, only serving as a public park since 2004. Before that time, this area was actually used by tobacco farmers. While it might not be as famous as Lumpini, Benjakiti Park offers visitors wonderful views of the modern Bangkok skyline. There are also plenty of trails sure to delight nature lovers. Benjakiti Park is open from 4:30AM till 9PM. Bangkok has one of the world's hottest nightlife scenes. Now that you're all rested, it's time to hit some of the Thai capital's best spots for an unforgettable night out. One of the most infamous streets in all of Thailand is Khao San Road just north of the Royal Palace. Due to its hostels, this small street has built up a reputation for being a popular haunt for global backpackers. Even if you don't plan on spending the night here, it's well worth your time to see what Khao San Road is all about. Along Khao San Road you'll find plenty of budget cafés, bars, and souvenir shops. One of the most popular performances you can see while visiting Bangkok is a ladyboy show. Bangkok is hailed around the world for having some of the best ladyboy cabaret groups. Many of these extravagant shows feature traditional Thai dancing, Chinese theatrics, and Broadway show tunes. The most famous ladyboy theater in the city is Calypso Cabaret in the Asiatique Shopping village. As one of the older cabaret shows in the city, Calypso has gained a massive following and is still the most sought-after ladyboy ticket in town. Besides Calypso, a few other popular ladyboy shows to research include Playhouse Cabaret and the Mambo Cabaret. Most ladyboy shows perform three times a day, but check with whatever theater you're interested in before booking tickets. If you're looking for a naughty night out, then look no further than Nana Plaza near the Nana BTS station. Situated in the heart of Bangkok's red-light district, this three-floor neon-filled establishment has numerous go-go bars, open-air bars, and clubs sure to get your heart racing. Nana Plaza is not for the faint of heart. Staff members working at Nana Plaza are very upfront and will try their best to get you into their establishments. Just be well-prepared before walking into this "adult wonderland." Nana Plaza is open between 7PM and 3AM. For your final day in Bangkok, go back to the historic center to take in a few exquisite attractions before heading home. Early morning, plan to visit Wat Saket in the Pom Prap Sattru Phai area. Sometimes called the "Golden Mountain Temple" in English, this Buddhist wat is best known for its commanding view of the city. You'll have to walk up over 300 steps to reach the top of the hill, but it's worth the effort. 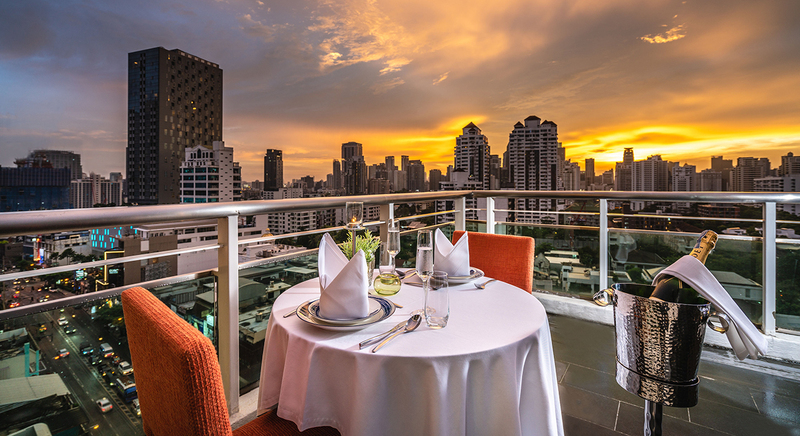 Wat Saket offers guests the best panoramic views of Bangkok. This temple tends to get packed with tourists in the middle of the day, so getting here as early as possible will give you a more intimate experience. Wat Saket is open from 9AM to 5PM and costs 50฿ to enter. From Wat Saket, you're only a short walk away from Thailand's Democracy Monument and another stunning temple: Wat Traimit. Built after 1932 when Thailand first adopted a constitution, the Democracy Monument is considered to be one of the most important monuments in modern Thailand. At this monument you'll find a symbolic carving of the constitution in golden bowls and four massive wings. As you walk around, take time to appreciate the intricately carved reliefs depicting important events in Thai history. After you're done seeing the Democracy Monument, walk into nearby Wat Traimit to admire one of the world's tallest gold Buddha statues. It's believed this 6-ton statue of the Buddha dates back to the 14th century. Amazingly, this statue measures almost 16-feet tall and was protected from damage thanks to layers of stucco and plaster. Wat Traimit is open between 9AM and 5PM. It's free to visit the gold Buddha statue, but you do need to pay a 10฿ fee to visit the wat's museum. One final Bangkok building you should see is the Phyathai Palace near the Victory Monument transportation hub. Built in the early 1900s, this intriguing palace complex was based on Gothic and Roman architectural styles. King Rama V built Phyathai to "practice" constitutional democracy before transitioning Thailand from a monarchy to a constitutional democracy. After a few decades, this palace was transformed into a hotel and today it serves as a hospital. You can tour this architectural gem on your own or with a guided tour. Luckily for tourists, it's 100 percent free to walk around Phyathai Palace! Now that you know what to do in Bangkok, its time to find a base for your visit. Akyra has two hotels to choose from in exceptional locations. Both Akyra TAS Sukhumvit and Akyra Thonglor offer five-star comfort and the convenience. It's very easy to get around the city from both of these hotels to all the destinations listed above. Plus, all Akyra hotels offer helpful services and amenities like in-room massages, family friendly packages, pool bars, and award-winning restaurants. There's no better place to stay in Bangkok than at one of these two Akyra luxury hotels.